Punjab, famously referred to as 'The land of five rivers', is situated in the north western part of India. It has a distinctive and lively culture. Punjab's nicknamed is the smiling soul of India. Here are seven tourist places to visit in Panjab. This ancient land is home to various shrines and places of historical importance. 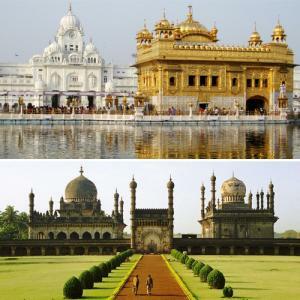 Here are the top destinations in Amritsar. Golden temple: City of Amritsar is home to various shrines and places of historical importance. Golden temple is the very famous holiest Sikh gurudwara, located in the city of Amritsar. Wagah Border: Everyday of the year, just before sunset, a flag lowering ceremony takes place at the Wagah Border between India and Pakistan. The Wagah Border ceremony is a popular tourist attraction and side trip from Amritsar.